Irish motor racing fans may soon have a real Dublin hero to support in Formula 1. For while Dalkey is already home to two of motor racing’s biggest stars, Eddie Irvine and Damon Hill, south Dublin could have a Formula 1 star it can call its very own. For Churchtown teenager Neil Shanahan, 18, is this year taking the Formula Ford Zetec Championship of Ireland by storm. Neil, who drives for the Mick Merrigan Motorsport team, has won two of the five races completed to date and lies in joint first position in the champion. 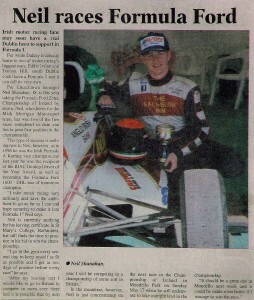 This type of success is nothing new to Neil, however as in 1996 he was the Irish Formula A Karting vice champion and last year he was the recipient of the RIAC Dunlop Driver of the Year Award, as well as becoming the Formula Ford 1600 – DHL Star of Tomorrow champion. “I take motor racing very seriously and have the ambitions to go as far as I can and hope someday to make it into Formula 1” Neil says. Neil is currently studying for his leaving certificate in St. Mary’s College, Rathmines, but still finds the time to practice in his bid to win the championship. In the meantime, however, Neil is just concentrating on the next race in the Championship of Ireland in Mondello Park on Sunday may 17th when he will endeavour to take outright lead in the championship. Driver Neil Shanahan perhaps the brightest Irish motor-racing prospect since Eddie Irvine has launched his 1999 season, where he will contest the British Formula Ford Championship. Shanahan (19), from Churchtown in Dublin has been signed up by the works Van Diemen team, an outfit that are expected to challenge for the overall drivers title. The Dubliner will team up with Richardo Van Der Ende of the Netherlands, who is in his second season in the UK series, and James Courtney of Australia, the double world Karting champion. Shanahan started racing in 1993, in junior karting, and by 1996 had risen to Formula A where he was second overall in the Irish National Championship. In 1997, it was apparent that Neil had the talent to go further and he raced in the Star of Tomorrow Formula Ford 1600 Championship. 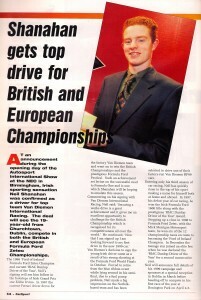 His championship success gave Neil Shanahan the distinction of being chosen as the 1997 Dunlop Driver of the Year. Last year Neil moved up to the ulta-competitive world of the Ford of Ireland Formula Ford Zetec series with the Mick Merrigan Motorsport outfit. A season-long battle with the likes of Chris Paul, Philip Kehoe, George McAlpin and Mark O’Connor meant the series went down to the wire in the last round of the championship. There, before the RTE Live TV cameras, Neil stamped his authority on the ’98 season with a win to cement a brilliant year and to earn yet again the Dunlop Driver of the Year accolade. In between Neil went to the Formula Ford Festival and World Cup at Brands Hatch last October where he made the semi-finals but suffered a blown fuel pump at the end of the opening lap – which possibly cost him a place on the podium. However, he had done enough to convince Van Diemen that this driver was to be taken seriously and he was offered the ’99 drive in the works car. The car and driver are now good enough to win the British Championship and hopefully, will be a springboard to a successful motor-racing career. The new Irish circuit motorsport season gets underway at Mondello Park on Sunday with the 1999 Ford of Ireland Formula Ford Zetec Championship. Neil Shanahan is the young kid on the block, a fresh faced teenager yet to face the pitfalls of first class professional sport but brim full of enthusiasm, talent and no little confidence. The carrot topped 19-year-old from Churchtown has hogged the limelight so much in domestic single seater racing in the past two years since he made the step up from karts that some people have been heard to wonder whether it was justified. Is he really as quick as his glowing press reports suggested, his rivals wanted to know. Well every time the question has been asked, Shanahan has responded on the track with blistering pace and much marked upon racecraft. He’s twice been voted Dunlop Driver of the Year for the Sexton Trophy after winning the DHL Star of Tomorrow Formula Ford 1600 championship and the Ford of Ireland Formula Ford Zetec championship. He won six races to his nearest rivals two in last year’s Zetec series and, if he did have to wait until the last round before clinching the title, then he did it in style with a convincing in front of live TV cameras at last September’s Leinster Trophy meeting. Then he went to the prestigious Formula Ford Festival at Brands Hatch, a knock out tournament of races for 100 of the world’s best Formula Ford racers. It’s a big meeting in the careers of aspiring F1 drivers which has been won in the past by current F1 star Eddie Irvine and Johnny Herbert while other Irish drivers on the role of honour include Derek Daly, Michael Row and Tommy Byrne. It was Shanahan’s first venture in big time racing and he did not disappoint. Having qualified on the second row for his semi-final he stunned the factory outfits in his privately run Bachelor Inn MMM Van Diemen by forcing his way into second place where he was challenging for the lead and a front row start for the final when his fuel pump suddenly failed. No matter, the point had been proven. The team managers of the factory outfits were suitably impressed none more than Ralph Firman, the boss of Van Diemen, who ran the incomparable Ayrton Senna in his early days. Shanahan is now set to follow in his footsteps and those of Irvine and Roe, having scooped the plum drive in the Van Diemen ‘works’ team in the British Formula Ford Zetec championship this year. It’s a big break and he knows it but Shanahan is not lacking in confidence or discipline. He knows what he has to do. The expectations will not stop there. Thanks to the double Driver of the Year award Shanahan is the most hyped driver to leave Ireland in some time. Well balanced and determined he seems well placed to deliver on the promise. Whether he can go all the way depends on him and the imagination of the right people in corporate Ireland. Ralph Firman of Van Diemen confirmed 19 years old Neil Shanahan would drive for the works team this year. Firman has kept a watch on the young Dubliner since he first took the racing scene by storm in 1997 – the year he took the Formula Ford 1600 title and the prestigious Dunlop RIAC Sexton Trophy as the Driver of the Year. He moved up to the senior Formula Ford Zetec class last year and won six of the 12 championship races to take the title and with it the prestigious Sexton Trophy Award for a second year. In addition to the Trophy, he received a generous support package from Dunlop, Stena Line and Castrol, allowing him to race in Britain. 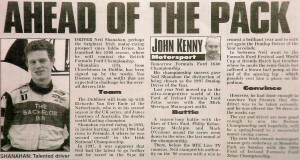 Neil follows in the footsteps of Eddie Jordan, the first Irish driver to race regularly in Britain 25 years ago. He will try and emulate the success enjoyed by Ferrari F1 driver Eddie Irvine who drove for the works Van Diemen team in 1987 and going on to win the British championship and the Formula Ford Festival that year. Van Diemen’s decision to sign the Churchtown teenager came as a result of a strong showing at the Formula Ford festival in Brands Hatch last October. Neil’s season starts at Donington Park on Easter weekend and will take in all the British championship rounds, as well as the Euro Cup, which is expected to visit Mondello Park at some stage during the year. At an announcement during the opening day of the Autosport International Show at the NEC in Birmingham, Irish sporting sensation Neil Shanahan was confirmed as a driver for top team Van Diemen International Racing. The deal will see the 19-year-old from Churchtown, Dublin, compete in both the British and European Formula Ford Zetec Championships. The 1998 ‘Ford of Ireland’ Formula Ford Zetec Champion and current ‘RIAC Dunlop Driver of the Year’, Neil’s signing will see him follow in the footsteps of Irish Grand Prix star Eddie Irvine. In 1987 the current Ferrari driver drove for the factory Van Diemen team and went on to win the British Championships and the prestigious Formula Ford Festival. Such achievement set Irvine on the successful road to Formula One and is one which Shanahan will be hoping to emulate this season. Van Diemen’s decision to sign the young Irish driver came as a result of his strong showing at the Formula Ford World Finals in October. Forced to retire from the blue ribbon event while lying second in his semi-final, due to a fuel pump problem, Neil made a big impression on the Norfolk-based team and has been selected to drive one of their factory-run Van Diemen RF99 cars. Entering only his third season of car racing, Neil has quickly risen to the top of his sport making a name for himself both at home and abroad. In 1997, his debut year of car racing, he wont the Irish Formula Ford 1600 title along with the prestigious ‘RIAC Dunlop Driver of the Year’ Award. Stepping up to a class in 1998 to Formula Ford Zetec, with the Mick Merrigan Motorsport team, he won six of the 12 championship races en route to becoming the ‘Ford of Ireland’ Champion. In December the teenage star joined an elite few when he was declared the ‘RIAC Dunlop Driver of the Year’ for a second consecutive year. Neil will announce full details of his 1999 campaign and sponsors at a special reception in Dublin in March before heading off to compete in his first race of the year at Donington Park on April 4-5.